This was an easy project that the kids and I completed a couple years ago. We cut the tissue paper into 1 inch stripes and then glued onto the outside of a mason jar. Using orange cardstock we cut out a carrot shaped nose and glue onto the jar. Once the glue was dry, we used a black marker to make the eyes and mouth. Add a small battery powered tea light candle and you are all set. 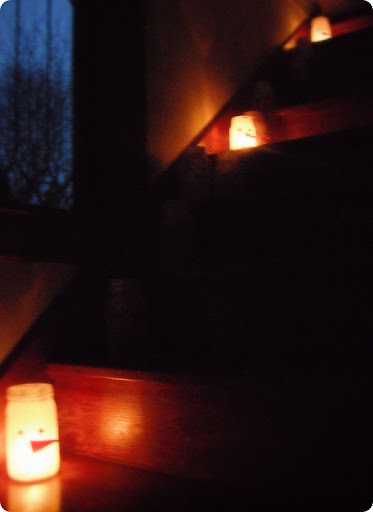 We made a set of eight and then lined them up our stairs. The snowmen give the stairway a fun glow at night. That is so stinkin' cute!! I have to make these! I love the up the stairs idea, too!! Thanks so much for sharing! I found you on Terrific under Ten Tuesdays. I just think these are so cute! Great job! These are very cute! I just did a post on a Mason Snow Jar similar to yours — if you have time, I'd love to hear your thoughts! How sweet! Thank you so much for linking up to Upcycled Awesome and Everything Else! this is absolutely darling. I'd love you to add it to my link party at http://raegunwear.blogspot.com/2011/11/link-party-what-we-wore-and-made_29.html . These are so cute! Could I possibly use the spray snow instead on the inside? I think I might try it to see! I love this! I've seen this done as a jack-o-lantern but never with a snowman before. I love it! I found you through Lovely Crafty Weekend. Thanks for sharing! That's really cute! We've made jack o'lantern versions of this project but I never thought to make snowmen! I'm back to let you know I decided to feature this in tomorrow's A Crafty Soiree. Thanks for linking up! so sweet! love this idea. cuuuuute! I love how you lit the stairs with them. This is so cute! Thank you for linking up at An Original Belle! Super cute! I wanted to invite you to link up at TGIF Linky party – http://livinglifeintentionally.blogspot.com/search/label/Linkey%20Parties – I know my readers would love this & any other kid friendly posts! 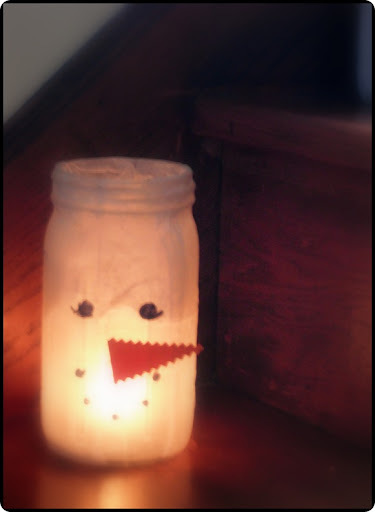 Fun use for an old mason jar! I love these cute guys. I'm doing the project with my preschool class at the moment and keeping a blog about all our crafts. I'm crediting your idea of course, thanks for the inspiration! (p.s. here's the post if you'd like to check out our versions!